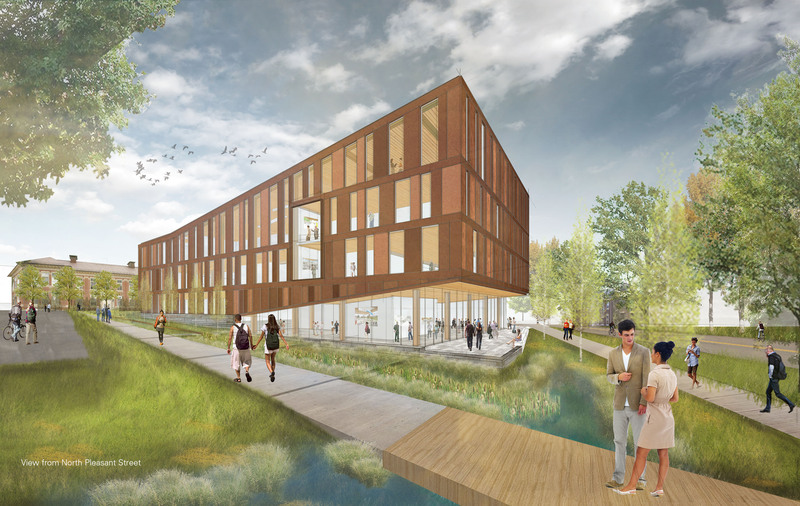 With architects seeking lower carbon building alternatives and renewable materials, there is a growing interest in innovative mass timber building systems. At the forefront is the University of Massachusetts, Amherst, and its new home for departments of Architecture, Building Construction Technology, and Landscape Architecture and Regional Planning using an array of mass timber products including glulam, CLT shear walls and composite floors to help reduce the building’s carbon footprint while meeting the same standards for safety and performance as other building types. Designed by Leers Weinzapfel Associates, the 86,000 sq ft Design Building will be the first of its kind in the U.S. to feature these innovative technologies in a unique, cantilevered form. Peggi Clouston, a UMass Professor researching wood products for over two decades, proudly notes, “this building will be a living laboratory to teach and inspire our students, the next generation of design professionals, about building sustainably with mass timber.” Clouston is leading an interdisciplinary team of faculty and graduate students at UMass on a companion exhibition that will feature a student-built timber grid shell and showcase the transformational advances in wood construction in recent years. For more on innovative wood design and mass timber, visit reThink Wood.